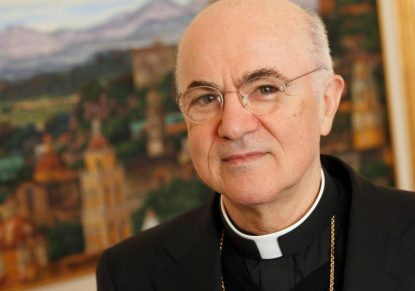 ROME (CNS) — A civil court in Milan ordered Archbishop Carlo Maria Vigano, a longtime diplomat and former Vatican nuncio to the United States, to return close to 2 million euro plus interest and legal fees to his brother Father Lorenzo Vigano. Father Vigano, a biblical scholar and priest of the Italian Diocese of Pavia who resides in Chicago, won the lawsuit against his brother the archbishop, who has been ordered to hand over 1.8 million euro ($2 million) plus interest and legal fees. The priest has initiated several lawsuits against the archbishop, and while many charges have been dismissed, this was the first to end with a ruling. According to the court ruling, which was handed down in October, Archbishop Vigano had received 3.6 million euro ($4 million) in net revenues from the two brothers’ joint assets, which, according to Father Vigano’s estimation in 2010, amounted to 20 million euro ($22.6 million) in real estate holdings and more than 6 million euro (nearly $7 million) in cash. The lawsuit was dropped after the archbishop returned $11,000 to the sister and made a $180,000 payment in 2014 through the sister’s lawyer, who in turn donated the sum to a religious hospital in Tanzania where one of Rosanna’s daughters had been working.